In the summer of 2012, Hybrid Pedagogy (my colleague Jesse Stommel is one of the editors) sponsored a MOOC-MOOC, a MOOC on MOOCs (Massively Open Online Courses). 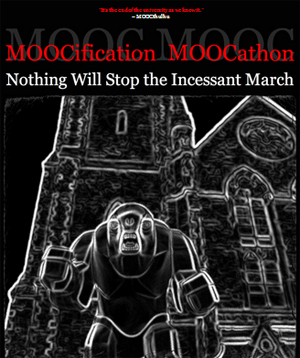 a MOOCification MOOCathon (love the quote from Moocthulu: “It is the end of the university as we know it”). I can’t even find my place in this lifecycle, it doesn’t list sorrow and a sense of failure. Here’s what the MOOC-MOOC has felt like to me. What I looked forward to, I have come to dread. Tonight I found myself sitting in front of my computer, my head in my hands, feeling like an utter failure. Saying for the 10th time, that’s ok, you are learning how to do something new, and that means you don’t know how to do it. Keep trying. Just another half hour. Realizing ten minutes later that I’m standing in front of the refrigerator, thinking about making some cinnamon toast – my version of comfort food. Out of my research language, I would say – I don’t feel a sense of place (there’s no there, there, for me), there is no social presence here for me (no people who greet me when I enter), I don’t have agency or a sense of personal power so I feel invisible, and I can’t figure out how to collaborate. I am bereft of a sense of presence. Yet I know that some of my favorite people are in there. Somewhere. Twenty-four hours later . . .
Ah, what a pitiful post. Got it out of my system. Thank you Sheila and Jesse for reaching back. I asked myself a lot of questions last night. Why did I feel such a strong sense of disappointment? What were my expectations? What was I hungry for that I haven’t been able to find? Last night I discovered a wonderful short article by Parker Palmer that had that description of fear that resonated for me. The article (Community, Conflict and Ways of Knowing) is about the communal nature of learning, but oddly enough, it was also about conflict, fear and love. He said “Healthy community . . . includes conflict at its very heart, checking and correcting and enlarging the knowledge of the individuals by drawing on the knowledge of the group . . . in the context of a supportive community.” This MOOC has the first part, but I haven’t been able to find the second part. Maybe I was hungry for an OOC, and its the “M” that is in my way right now – feels massive, manic, and monolithic. I don’t know how to “do” MOOCS, which is all right, learning is about not knowing, and that’s good for me. But right now, its not much fun. “The kind of community I am calling for is a community that exists at the heart of knowing, of epistemology, of teaching and learning, of pedagogy; that kind of community depends centrally on two ancient and honorable kinds of love. The first is love of learning itself. 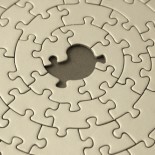 The simple ability to take sheer joy in having a new idea, reaffirming or discarding an old one, connecting two or more notions that had hitherto seemed alien to each other, sheer joy in building images of reality with mere words that now suddenly seem more like mirrors of truth – this is the love of learning. He’s talking about students, but I think we are in each other’s care in any learning community – love of learning, love of the learners.